Goldism – practiced by people who will argue that bankers are charging usury on paper loans because it’s not “backed by gold”. So therefore, the paper has to be backed by gold so bankers can charge usury. And ‘backing’: With WHAT would YOU back ~YOUR~ fiat specie? I defined it already and the same thing it’s backed by now. And WHERE did you ‘define’ goldism? You’re about 2 or 3 years of diligent study away from knowing exactly why a piece of paper with this – $ on it is worth anything and why we use it in our commerce. You just know it works for you. Bankers have a profoundly better understanding of $ than you. The problem is the bank is facilitating the cash supply, not that it’s not backed by gold. Oh! Oh! So sorry to have ‘bothered’ you for a simple explanation of ~your~ particular definition for a term which you employ. I find it ~rather interesting~ that a simple question renders your kind of response. Sorry bro. No bother. No worries. I don’t express empathy like most people do. Bankers loan paper essentially that anyone can potentially create themselves. Does that make sense? Pieces of paper and bits of metal cannot ~ever~ be said to have any degree of ‘equality,’ save in the fact that the former is ‘receipt’ for the latter. Well, I had ~no idea~ that ‘someone’ owned all of the gold in the world! You don’t need to own all of something in order to exercise monopolistic control over it. So only metal or metal receipts should be lent? It’s the religion of those who believe the problem with money is that it’s not backed by gold, when the problem is usury. And then there’s the Antidebts – those who believe the problem with money is debt, when the problem is usury. I’m a Prodebt. I believe money is debt and the problem is usury. Usury is its own problem. Backing is something else altogether. Who’s gold do you propose back the money? This is good, we’re creating the first “Gold Standard Monetary Reform Act”. So if I want to redeem my gold after earning a gold backed dollar, who do I go to? http://www.youtube.com/watch?v=tGk5ioEXlIM 13:04 – They show a toilet paper roll made out of $ bills and then a stack of gold bars sitting there doing NOTHING! With propaganda like this, how can you win? Disgusting. I’d like to kill the “gold standard” paradigm so I can move on to the “debt free” paradigm. $ means debt, it doesn’t have to be with private bankers and usury. I’ll agree that the basing of one’s fiat paper upon a ~single~ metal, is at best problematical, if only because metals may be manipulated in the marketplace, and in the process manipulate the specie as well, resulting in damaging trade ramifications. But again, and as I’ve stated priorly, more than anything else, it’s the assigned ‘face value’ to metal coins which leads to the downfall of that specie. So, if coinage is minted at weight values only, then the ability to manipulate value is minimised by dint of the fact that the reflected market values will apply everywhere at once. Finally, if paper specie is ‘spendable’ ONLY within the borders of the issuing nation, and no place else, then regardless whether a nation inflates its paper specie, that impact will affect ~only~ its own citizens, inasmuch as that fiat specie will be worth less as gauged against the metals themselves. Who are you going to borrow the coins from? People with huge vaults full of gold. That just won’t happen. People will continue to create a fiat currency in the wrong way and live under banker control. Think short, one point replies. Well, since the blog isn’t allowing me to post a reply to your specious question, I’ll post it here. Well, let’s see here. Why borrow the coins? Gold moves in commerce all the time. Ergo, there will be nations or private entities who will mint coins of various weights. The purity of those will be stamped upon the coin. Anyone found diluting the coinage will soon be found out. Next up: The creation of fiat specie. Again, as before, if each nation produces its own fiat specie to be used ONLY within its borders, and if NO TRADING of specie is allowed anywhere, then your supposition is baseless. You should follow your own advice. But aside from that, I don’t do ‘sound bites.’ If your attention span is limited to a single point, then why bother having a conversation? I’ve increased the comment nesting level by another level to match the increased demand. And you don’t believe in inflation? ET, There is inflation. It’s a minor issue. People that believe it’s a major issue because of the controlled opposition scare mongering are called “inflationist’s”. They suffer from the religion Inflationism. And no, that’s not how the Encarta Dictionary defines it. A ‘minor issue’ you say? Really now? How did that ‘minor issue’ work out for every nation which inflated it’s money supply to the point of the absurd? Talk about the Weimar Republic, where —quite literally— people were using wheelbarrows full of paper money in order to by food staples. Talk too about Zimbabwe, and its ‘100 Million dollar’ note which is being circulated. It’s a ‘minor issue,’ you say? ET, You don’t have to quote every time. Yes, hyperinflation is bad. We’re never told the truth of how it happens. If you can’t figure out how to create a debt instrument without having someone with a huge vault of gold sitting there doing nothing controlling it, they’re always going to control your life. Bankers could care less about a currency collapse. They cause them. People will invariably go back to them for their currency. Inflation is as real as deflation, but the inflation boogeyman is used to create an irrational response so people don’t realize that without inflation under our current debt and compound interest-based monetary system, the banksters would eventually own everything, and all the more so under a gold standard, free market or otherwise. FauxC, There you go. You should say “current compound interest based debt as opposed to interest free debt monetary system”. Then we could get on to how to transition without pandemonium. And they do already own everything. They can only extract so much. That simply makes no sense at all. Without inflation, there would be no deflation, and precisely ~how~ would the bankers own everything if they can’t lend anything? If the only entities issuing fiat specie are the governments themselves, and if that specie is good ONLY within the national borders of the issuing nation, then whatever inflation would exist ONLY within those borders and no place else. Finally, you keep saying ‘gold standard.’ But as I’ve pointed out several times now, if no nation resorts to a single metal as a standard, and instead uses all metals in coinage with ounce weights, allowing them to ‘float’ internationally, then how are whatever banks going to manipulate much of anything? If each nation’s treasury were the only bank of resort for industry within each nation, then banks simply won’t exist, period. ET, Your missing one important fact – banks don’t loan anything. It’s an illusion. They just shuffle people along a debt line. They profit off of the debt. The debt line could be facilitated by a public bookkeeper. It’s not that there is no gold backing. It’s not that currency is used in international trade. It’s the usury. How do you suggest the government introduce the currency? If the nations treasury is a bank, then banks will exist. Well, actually they do: They loan credit. To answer your first question: Just as happened at the beginning of the Republic, and during the Civil War/War of Northern Aggression. In the first case it was Colonial Script, and the second it was the Greenback. In fact prior to WWII, Japan dumped its privately owned central bank (which really ticked-off Rothschild’s) and went with what I suggest we should copy. Their treasury became the sole bank to industry. And, whilst the rest of the world was in the doldrums of the ‘Great Depression,’ Japan’s economy was steaming along at full strength. It was only upon their surrender that the U.S. (under the aegis of the bankster cadre) that Japan was =forced= to implement a privately owned central bank as one of the conditions imposed upon them, and they’ve been there ever since. It should be noted that at the time (pre-WWII) poverty was unheard of in Japan, if only that any citizen was able borrow money from the treasury at almost zero interest. The treasury controlled the amount of specie in circulation such as to balance out the loans with subsequent taxes, and the paid-back loans. Finally, private banks won’t exist. The treasury would simply have branch offices. Want to get rid of usury? Want to make inflation and deflation a thing of the past? Well, there ~is~ a way. Actually, there are several. Portability of wealth beyond national boundaries would still be via metals. How hard could it be? You are correct, banks do loan pieces of paper essentially. There are many details missing here as to how colonial scrip and greenbacks were issued. Maybe details aren’t important. Maybe in Japan the slave class was better off than most at one time. I have a theory about Nagasaki/Hiroshima – no banks. I could care less about inflation. Countries should trade goods for goods which doesn’t even make sense when every country has about the same relations of natural resources. ET, I try to keep it to one point. I see, you’re concerned about the inflation boogeyman. Yes, bankers extracting billions in wealth. Wow, a candy bar cost a nickel 70 years ago. Yes, “inflation boogeyman” is what I’ve noticed detractors of non gold-backed money make it out to be. I stopped believing in the boogeyman since I was a kid, and I think the monetary reform community should stop believing in the inflation boogeyman as well, since what they both have in common is being an irrational scare tactic. the real double standard is that government declaring gold to be legal tender is a goverment decree (fiat), creating fictitious demand for gold, corrupting the commodity market in gold and money. free market champions should want gold to remain in the free market. they should not want government to corrupt the free market in gold by declaring it legal tender. If gold remains in the marketplace as a tangible means of trade, then it does not matter —in the least— whether it is used as specie, or merely traded as a commodity. Whenever ~any~ commodity is assigned a face value, i.e. dollars and cents, market manipulation supersedes that face value such as to ether devalue or inflate that stated value. You don’t need to look very far to see evidence of just that. As before: If every nation on this planet printed its own paper specie to be used ONLY within its borders and NOT anyplace else as legal tender, and not allowed to be traded in international markets, then what we witness in the present sense would not be happening. And again: No coinage should ~ever~ have a face value. All coins should be minted in internationally recognised weight values, such that they are universally recognised in trade. Of course, the international banking cartel would ~never~ go for any of that as they could not in the least make any money at all. of course they would: The few coins that are owned by individuals are debt free, but once they spend them they quickly end up with the banks. Every coin that enters the banking system leaves it only as an interest bearing debt. 99,9999999% of the gold is owned by 0,000000001%. Gold as currency is a complete and utter fraud. The real solution is interest free paper money. Don’t fall for the Austrian’s “aaargh, fiat currency, booh, bad”. The key issue is interest. no, the international banking cartel would never want a one world currency… never… a world bank and world currency based on a rare precious metal that could never be inflated to reduce the burden of debt and interest and that would increase in the value, allowing those with all the gold to steal value from everything else in the economy. no, the international banking cartel and aristocrats would never want to be able to steal wealth in their sleep while their money increases in value. Yes, and I wrote how Austrian economist Tom DiLorenzo repeatedly lambastes Lincoln for many things, including signing a bill making interest-free paper currency legal tender in the United States, but has never attacked George Washington with the same viciousness for signing a bill that subjected U.S. taxpayers to the full cost of striking gold owned overwhelmingly by wealthy interests, and making those coins lawful tender across the United States. As before: NO coin should ~ever~ be minted with a face value. Rather, the weight of the coin should be the only thing seen and used. It is ~only~ when coins of whatever substance are imprinted with an assigned face value, that manipulation takes place, because regardless the face value, the substance will be traded for what the market will bear, and thus supplant the face value. If coins are minted with weight values, then virtually nothing done in the marketplace will either inflate or deflate the intrinsic value of the substance. Your article is something of the disingenuous. First, the Founders of the United States had it in mind that gold and silver would be the primary specie. His prediction has come true, in spades! The way out of this mess is for the U.S. Treasury to go back to printing debt-free fiat currency. That would be buttressed with a Constitutional Amendment which would mandate that the amount of printed specie in circulation would be absolutely limited by the actual population in existence, i.e., a dollars-per-person limit, which could not be exceeded by the Congress without there being a declaration of war. That would be followed up with an absolute prohibition against the use of the fiat currency being used or traded ~outside~ the shores, borders, or territories of the United States. The fiat currency would be entirely internal. Any American citizen found to have engaged in currency trading would be charged with high treason, and any foreign person or nation found to have been engaged in such would be charged with an act of war against the United States. 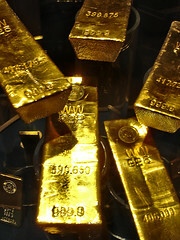 Precious and semiprecious metals would still be used in trade, but would NOT be given face values. Rather, all coinage would be in ounce weights (or other internationally recognised weights). Those coins would form the basis for the portability of wealth across borders. Credit transactions would still be afforded, with transnational movements of money predicated entirely upon the metals in trade. The beauty of that system is: No manipulation of the specie is legally permissable. The amount of specie would remain relatively constant affording a very large degree of protection against both inflation and deflation. There would be no need to levy taxes upon the citizenry, inasmuch as the Congress would simply be able to spend ~only~ what the Treasury had, and nothing else. The treasury would levy a specified interest upon loans made to industry. Both the interest collected and the paid loans would be used to sequester excess specie in order to prevent inflation. Finally, the Treasury would become the bank of note, with all other banks being outlawed. Credit unions would be the place for private deposits and personal banking, thereby eliminating the ability of private persons engaging in manipulation of money. Under a banker’s gold standard you have structural deflation, alternated with asset bubbles. Under a banker’s paper standard you have structural inflation, alternated with deflationary busts. Under both the poor are interest slaves. Banker’s Paper is slightly less bad, because inflation at least encourages economic growth, while deflation is continued depression. Government paper needn’t be inflationary: Social Credit is the best way to go. However, Social Credit does not allow for interest free credit. Therefore a Government debt free standard should probably be combined with a currency market where market players can offer their own standards. In such a market interest free Mututal Credit facilities would dominate. The only problem with a book entry currency is giving a private “bank” control of its creation, and the ability to charge rent on the book entries they created. Just as in the game of Monopoly®, we are supposed to start out with a lump of cash that is loaned to us, but unlike Monopoly®, we have a choice of which road to go down.